There are probably more that a few people who might balk when offered the opportunity to fly on a 62 year-old plane, but I'm not one of those people. 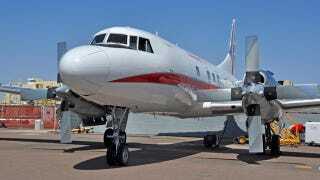 So last week, I got to fly on Honeywell Aerospace's Convair 580 — directly toward the mountains in Phoenix. "We're going to take a run at some mountains" said the Honeywell test pilot during our pre-flight briefing. The other 9 passengers and I, all of us aviation media, looked at each other with nervous grins. The whole purpose of the flight was so Honeywell could demonstrate their Enhanced Ground Proximity Warning System, or EGPWS. If you have never heard of the Enhanced Ground Proximity Warning System, it's one of the most important tools on the flight deck. It alerts pilots to the the potential danger of hitting the landscape by calculating speed, altitude, climb/descent rate and distance to potential obstacles in the path of the aircraft. That information then appears on a screen in a real-time picture along with any applicable warnings. Honeywell has over 30 years of experience with these systems, and their work has helped drastically reduce the number of CFIT (Controlled Flight Into Terrain) incidents. 2012 was the safest year on record, with nearly 2.5 million successful flights per fatal accident (on planes with 14 seats or more). Here's a bit of history on the plane. Honeywell's Convair 580 was originally a Convair 340, delivered to United Airlines as N73102. 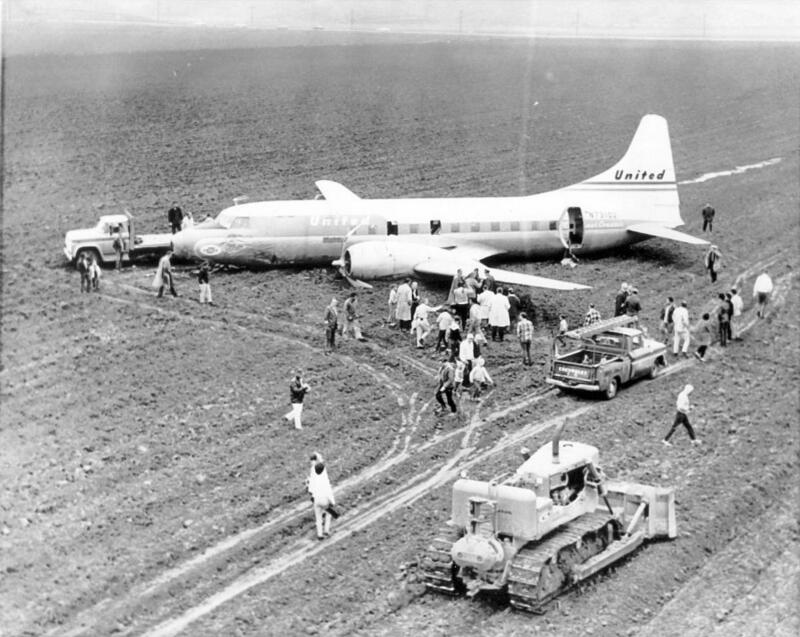 In my research, I learned that the plane suffered a forced landing [photo] in a carrot field in 1964 due to fuel starvation. United hoisted the plane out of the mud, made repairs, and was able to fly the plane right out of the field! Frontier bought the plane in 1966 and converted it to a 580 by swapping to turboprop engines. Now 48 years later, it's still going strong, and helping to test the newest safety equipment in a real-world environment.Honeywell also has several other aircraft in its test fleet, including a Boeing 757, a Dassault Falcon, a Gulfstream 250 and a Eurocopter AS350. For our flight, we departed from Honeywell's facility at Phoenix Sky Harbor and made our way toward the mountains bordering Phoenix. It was a bumpy ride as thermal turbulence tossed us around quite a bit. It was the side-to-side "yaw" motion that got to me the most, but we all managed to hang on to the lunch we had just completed an hour earlier. As we approached the mountain (top photo) the EGPWS did its thing and sounded audible alarms "TERRAIN TERRAIN" and as we got even closer, "PULL UP! PULL UP." It was really a thrill — not only the experience of riding on a historic aircraft, but also the educational experience.